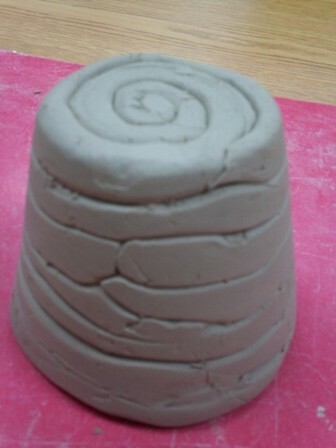 Several years ago a friend of mine went to a clay workshop & they suggested using flower pots as a form for students to build their coil pots in. At first I wasn't sure, but after trying it....I was a believer!! I have almost 100% success rate now with coil pots, and before...there were always a few students in the room that just couldn't do it. 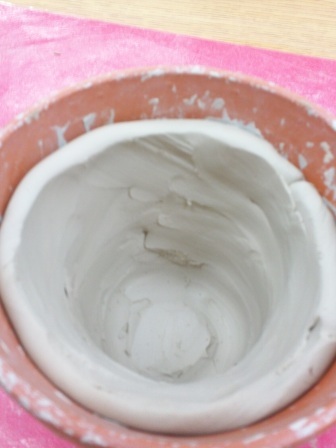 The pots also absorb moisture from the clay which speeds up dry time. You need to place some tape in the bottom of the pot if they have a hole...if you don't..they will have an outty on the bottom which will set your pots to rockin'! Students write their name on tape stuck to the side. 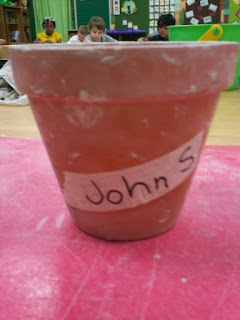 This way I can rewrite their names on the bottom of the pot the next day when I pop them out. 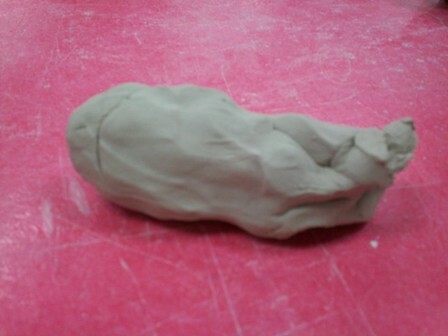 Give each child a lump of clay. 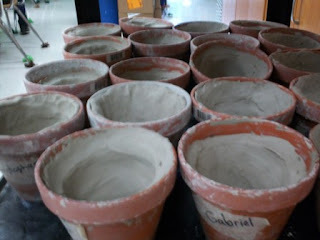 I guesstimate it, and let the students know they can have more clay if needed. After so many years of doing it...I'm usually spot on. 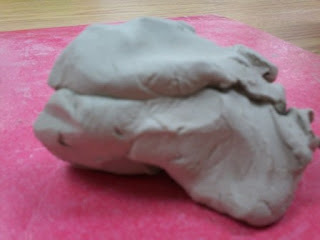 Have the students take a small chunk of clay and squeeze it in their hands into a cylinder type shape. I feel this is easier than rolling it into a ball, but you do it the way it works best for you & your students. I have the students start the coil in their hand, but quickly have them move it to the mat(laminated 12x18 construction paper). 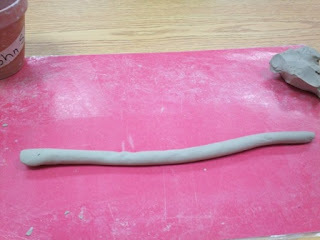 I tell them to roll up and down the clay using a flat hand. To begin their pot they must make a coil "cookie" for the bottom of the pot. 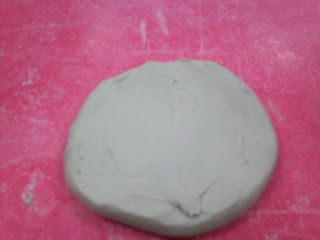 I tell them to roll it like a snail shell, and then check to make sure it will fit in the bottom of the pot. 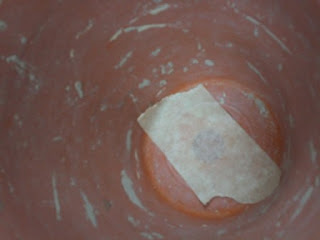 They then need to smooth the one side of their coil cookie, and that will become the inside of the bottom of their pot. 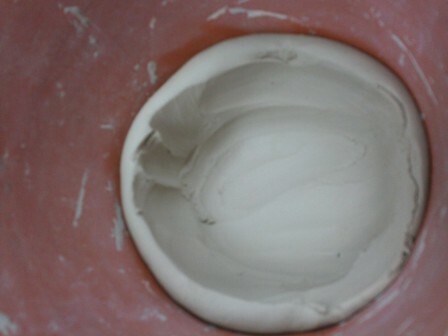 Place the smoothed coil cookie in the bottom of the pot. 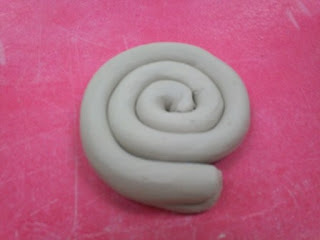 Repeat making a coil(some kids like to call them snakes), and place it in the pot going around the edge of the coil cookie & beginning to go up the wall of the pot. 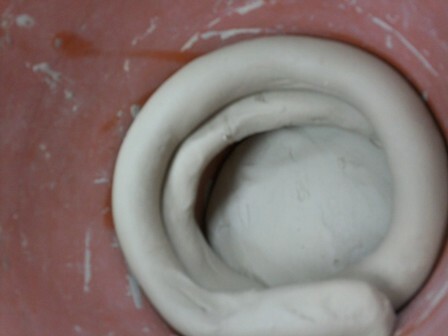 Each time a coil is added, students should smooth the inside of their pot till they see no lines on the inside. I usually encourage my students to push down when smoothing their pot, because when some students pull up...they begin making the walls too thin & flat to the walls of the pot(which will crack if they do that). Repeat process till they come to the top of the flower pot(or close to it). Let clay dry over night. Pop clay out the next day and carve students name into the bottom of the pot. 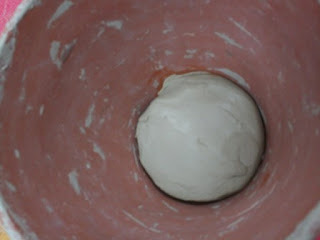 They clay is still moist, but the form is set. Allow to dry for 3 or 4 days(depends on humidity, thickness of pot..etc), and fire. I usually will let my set for a week, just to be safe. I was JUST at Michaels looking at those clay pots...if only I had grabbed one to give this a go! :) thanks for the new method! That is just awesome! 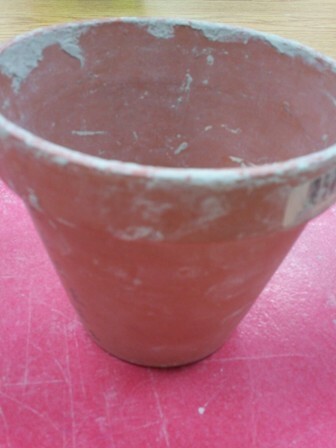 I recently went to a clay workshop given by Mayco and he said you can glaze those terra cotta pots and fire them. Gotta try that too. Sorry- my phone auto-corrected the last comment I left and it made no sense!! What a great idea! I love any way to make clay easier! Loved the Clay pots.. to make the Coil pots.. Thats a good one..
Never tried it this way! Cool! Great idea! I wonder if this would work with air-dry clay? That's all we have... major bummer! Have you ever worked with the air dry stuff? Anybody else? I can use all the help I can get... after five years of working with it, it still gives me nightmares every time we use it! Thank you! I will try this ASAP. Today we were all covered in the air-dry crud--er, clay--and slip, and the kids did a fantastic job, but I wanted to run away and hide, ha. And yes, acrylic is KEY! Thanks! I have grades 1-8 and was worried about the younger kids constructing coil pots, thank you for this!